TPC Overall Rank: #204 out of 2933 rides. This ride is great. It os pretty long to get up to the top. Although I don't seem to get vey wet unless I sit in the first seat. The water cannons seem to be the only thing that splashes. The drop is great. Excellent water ride that is right up there with the best of them. The theming was excellent and really added to the ride, along with its excellent landscaping. Also the ride was much longer than I had anticipated and the drop was incredible. Not only was it really tall and steep, but it was also very fast and it gave a stomach dropping sensation. The splash got everyone pretty wet, but not completely soaked. Daredevil Falls was an okay log ride, but I did prefer Dollywoods other two water rides (Mountain Slidewinder and Smoky Mountain River Rampage) to this one. Take a look at the picture above these reviews--the final drop looks truly fantastic. It lures you in and leads you to expect a somewhat better ride than it actually delivers. I think this is probably the first log ride Ive been on that has side-by-side seating with actual backrests, so the logs looked cool, but I cant say that this set-up was necessarily any better or worse than a typical log boat. The ride meandered along the course at a very slow pace, at ground level the entire time up until the very end. I know there was theming, but it must have been pretty unmemorable, because I cant seem to remember much of what I saw. Finally we climbed the lift, rounded the top, and came down that wonderful-looking drop, which did prove to be very fun. It provided the appropriate splash factor for a log ride--not too wet, but you wont stay dry either. Overall, I was a little underwhelmed with the ride itself, but I still think its right up there with Splash Mountain and Dudley Do Right as one of the most photogenic log ride drops ever. I love this ride absoulutley love it.I rode it twice.I got wetter the second time though.I was kinda scared because the logs dont stop and you dont even have seatbelts.On the second time I rode it I put my hands up and then put them back down because I almost fell out.It was so fun. Nice themed water ride. This is no splash mt. but i didnt expect it to be since its in dollywood not disney world. I wish there were more than just 1 drop. This was a fun ride, but as far as themed flumes go it was rather bumpy and uneventfull. I liked that I didnt get too wet on it and the drop was pretty good, although there was only one drop. It was landscaped well with the terrain which is what makes it acceptable, so Id say its a solid flume ride but not anything special. I was a bit disapponted with this ride (as well as most of the rest of Dollywood). One of the biggest reasons was the false advertizing that the park had for this ride. On the park propaganda, they claimed the drop on the ride was record breaking and the description of the ride made it sound like a water coaster. 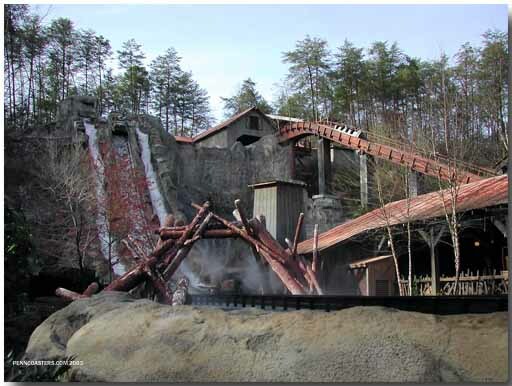 As it says on Dollywoods website: "The Highest, Fastest Waterfall Ride in America." If the drop broke any records, I cant imagine what they would be. Ive been on much higher and faster waterfall rides within America. It wasnt a water coaster either. It was basically a normal log flume with large logs. I am used to Disney/Universal style themeing on rides, so the themeing was sort of disappointing too. When the ride started out by going into the dark tunnel, I was optimistic that the theming would be halfway decent. All the theming consisted of was some lumber mill equipment. No animated audio-animatronics. No card-board cut outs. Just a buzz saw. And most of all, NO STORY to the ride. Rides like this should have a story. For this reason, Blazin Fury was one of my favorite rides in the park, although really old and dated. But then again, Im just spoiled by the Orlando theme park water rides with in-depth stories, and its what Ive come to expect with rides. In the middle of TN though, its hard to expect the same standards. This ride also had station problems. They never stopped the boats. In the station, the boats moved onto the conveyor and the people in them got out of the boat while still moving, and then new riders got in without stopping the boat. Ive never seen a water ride that never stops, and to me it seems a bit dangerous to step that far down into a moving vehicle. If they dont stop the boats, they need moving sidewalks moving at the same speed as the boats. Probably too high tech for Dollywood... The loading was a big problem, especially for little kids or older people, and caused boats to go with sometimes only one row filled. And arent you supposed to get wet on water rides too? I couldnt even get more than a mist on the bridge that gets splashed after the ride was over. This is one of the fastest water rides Ive ridden wich gives it alot of points for me. This is a good ride for people who like getting there picture taken! Funny pictures while your going that fast!! !